Secret contacts between the Kremlin and the PMO lead to a visit by Russian President Vladimir Putin to Israel next month. Following secret contacts between the Kremlin and the office of Prime Minister Binyamin Netanyahu, it was agreed that Russian President Vladimir Putin will visit Israel next month, the Hebrew-language newspaper Yediot Acharonot reported on Friday. The trip will be one of Putin’s first official trips since his inauguration for a second term as President. According to the report, the exact date has not been determined but the visit will last for 24 hours. Netanyahu and President Shimon Peres are reportedly planning a special reception for Putin. During the visit, an event honoring Israel's relations with Russia will be held, and Netanyahu and Putin will inaugurate a national monument in Netanya marking the Red Army’s victory over Nazi Germany. 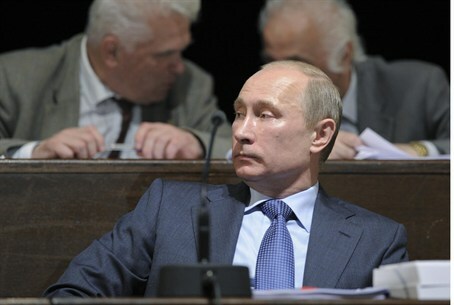 A few months ago, Putin warned against a military strike on Iran’s nuclear facilities. In an article he published as part of Russia’s foreign policy, Putin said Russia is concerned “from the growing threat” of an attack the Islamic republic's nuclear program in the country.